Lebanon is often in the news for bad and possibly dangerous reasons, or for reasons highlighting its extravagant nightlife, which is quite a juxtaposition, however, I want to bring to the spotlight the sports accomplishments rising from Lebanon. You probably don’t know the names of most of these people, but that’s about to change. Let’s start with the original notorious fitness star from Lebanon, Samir Bannout. He was named "the Lion of Lebanon", Samir Bannout won the Mr. Olympia title in 1983. At that time, only six men had held this most prestigious title since the contest began in 1965. He has also ranked highly in Mr. Universe, Mr. International, Middleweight, and several Grand Prix events. I also think that mustache should have an award of its own. So, Maxime Chaya is what one might call a little extreme, an adrenaline junky, a guy who basically wants to get as close to death without dying as possible. 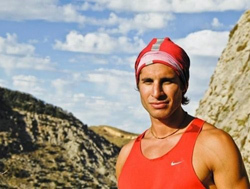 On May 15, 2006, he was the first Lebanese to climb Mount Everest, completing the Seven Summits challenge. On December 28, 2007, he also became the first from the Middle East to reach the South Pole on foot from the Antarctic coast, after an unsupported and unassisted journey that lasted 47 days. Then, on April 25, 2009, he reached the North Pole on foot, all the way from Canada. I’m tired just typing this down, and he did all of this? 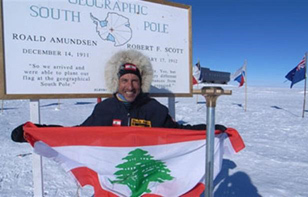 Peter, a mountaineer and adventurer, founded “TEAM LEBANON” an all Lebanese team determined to climb the world’s 7 summits (the highest mountain on each continent) and raise awareness & funds for the Lebanese Red Cross. They have already successfully climbed 5 of the summits, (with Antarctica and Everest left in the sight line). You can watch his TEDx talk about his passions and adventures here. Last but certainly not least, our very own Maya Nassar broke out into the fitness model scene in 2013, after failing to place in the Miami Pro European Championships, she returned the next year at the 2014 Pure Elite UK Championships endorsed by the Lebanese minister of sports becoming the first Lebanese athlete to be endorsed by the government in Lebanon to compete in a bodybuilding event outside of Lebanon., AND she won first place in the bikini babe category. She’s continued to participate in competitions, and she’s appeared on the covers of several fitness magazines in the Middle East. 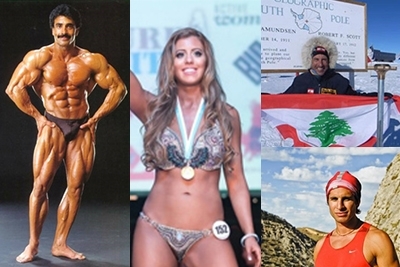 So, if you any fitness or athletic aspirations take these few examples from our homeland of Lebanon, and go pursue your dreams!